Sam Houston State University Provost David Payne has announced the appointment of Dana Nicolay as interim dean of SHSU’s new College of Fine Arts and Mass Communication, effective Jan. 1. Nicolay is currently professor of dance and associate dean of the College of Arts and Sciences. The Texas State University System Board of Regents approved the creation of the new college last summer and the Texas Higher Education Coordinating Board approved it last week. The new college will comprise the departments and programs of art, music, dance, theatre and mass communications, which includes emphases in print and broadcast journalism and public relations. Movement of academic departments to the new college will take effect June 1. “In the meantime Dean Nicolay will work with department chairs to put in place college policies, budget plans and accounts to facilitate a smooth transfer of departments and programs to the new college,” Payne said. The performing and visual arts programs are currently in the College of Arts and Sciences; when those programs move to the new unit, the College of Arts and Sciences will be renamed The College of Sciences. The department of mass communication is located in the College of Humanities and Social Sciences. “Mr. Nicolay has the administrative skills, experience and knowledge to lead this new college through this very critical period of development. I am very pleased that he has accepted this new assignment,” Payne said. “We have nationally recognized academic programs in dance, theatre and music and now we have a magnificent world-class facility, the James and Nancy Gaertner Performing Arts Center, to support them with state-of-the-art instructional space, practice rooms, studios and performance theatres. 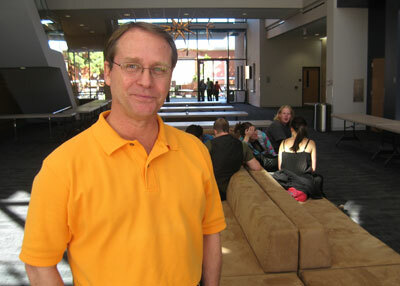 Nicolay has served as associate dean of arts and sciences since 2004 and has taught at SHSU since 1987. He earned his Master of Fine Arts in dance from Texas Christian University. He has been active as a choreographer for dance and musical theater, choreographing more than 50 productions. As a dancer in his early career, he performed with the Contemporary Dancers Canada, the Houston Ballet and the Royal Winnipeg Ballet, among others. Nicolay has also been active in community service. He chairs the Huntsville Arts Commission and serves on the Wynne Home Arts Center management committee and chaired the Huntsville Cultural District Steering Committee. “The completion of the new performing arts center and the creation of the new College of Fine Arts and Mass Communication are major steps forward for our students and the community,” Nicolay said. “The administrative alignment is a natural evolution for us as a university. It just makes a lot of sense to group these disciplines together. Nicolay said he has already witnessed the impact of the new facility in terms of attracting new patrons from the greater-Houston area to events, in particular the grand opening, the Houston Symphony and the Dominic Walsh Dance Theater. Nicolay said he was honored to be named acting dean.